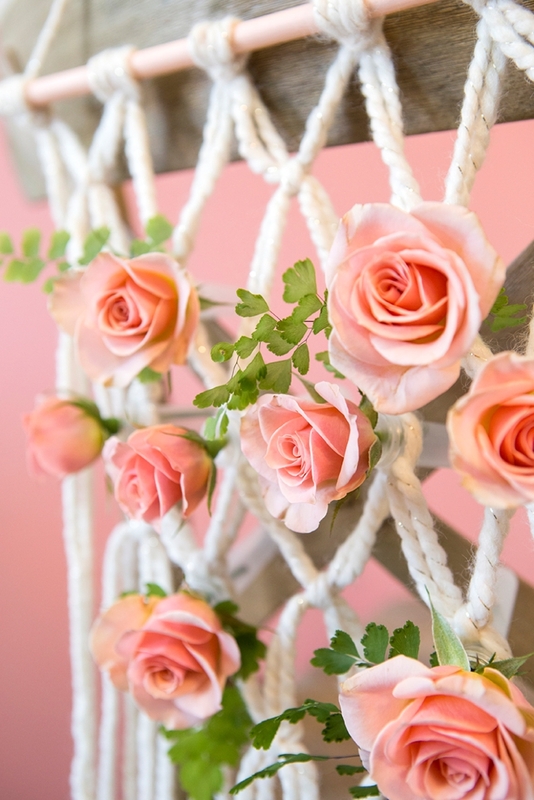 You HAVE To See This DIY Macramé + Flower Reception Chair Decor! 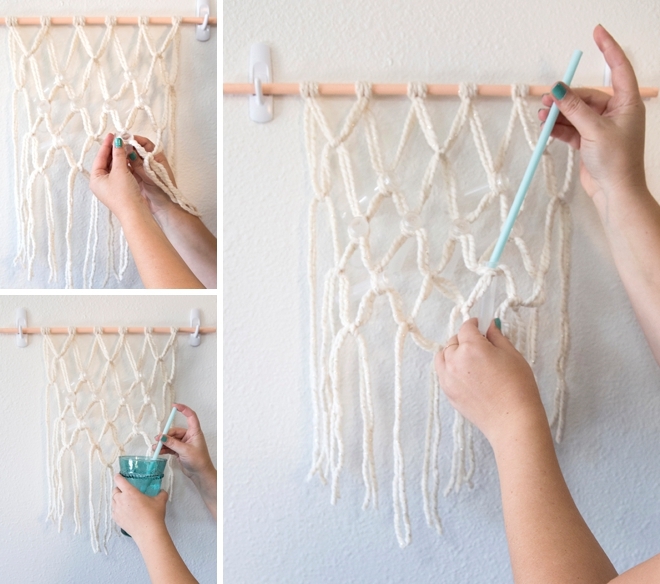 Let me start by saying that this isn’t really macramé, it’s more along the lines of just tying simple, double knots over and over. 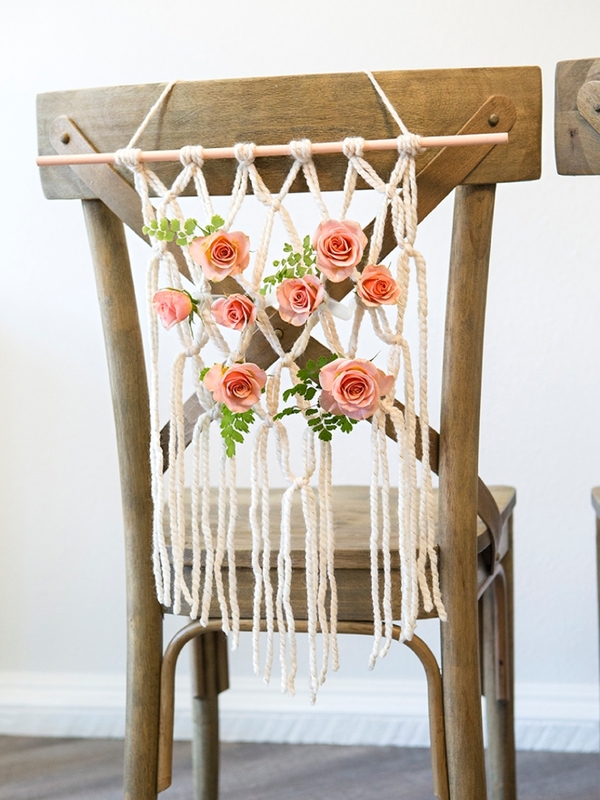 Since yarn wall hangings and macramé are both so popular right now, I kind of blended the two and added some pretty peach mini-roses to create this fabulous boho, reception chair decor idea. 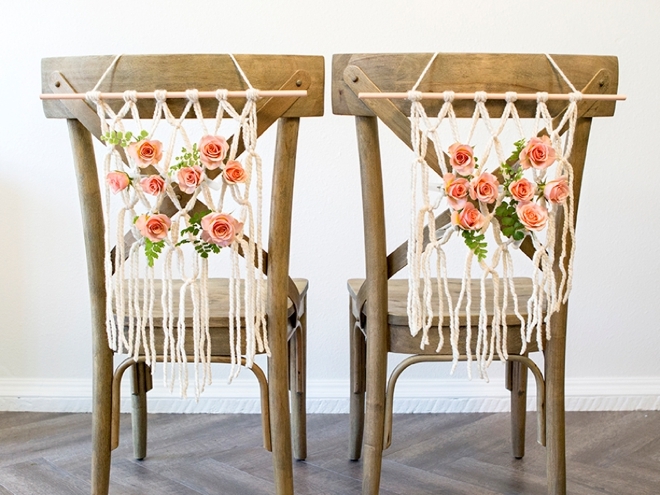 The look of flowers hung across chairs is stunning… but what isn’t stunning is when they are wilted by the end of the night. 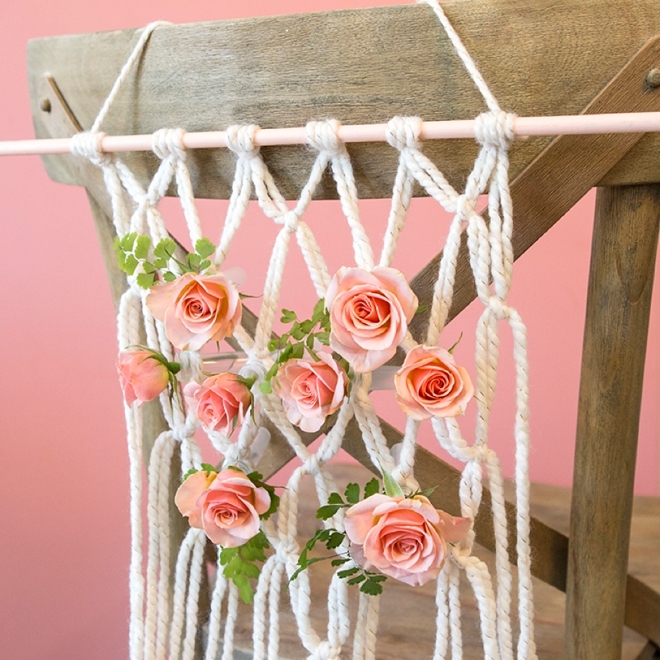 So by adding the water tubes in the yarn, we can keep the flowers hydrated and beautiful all reception long! 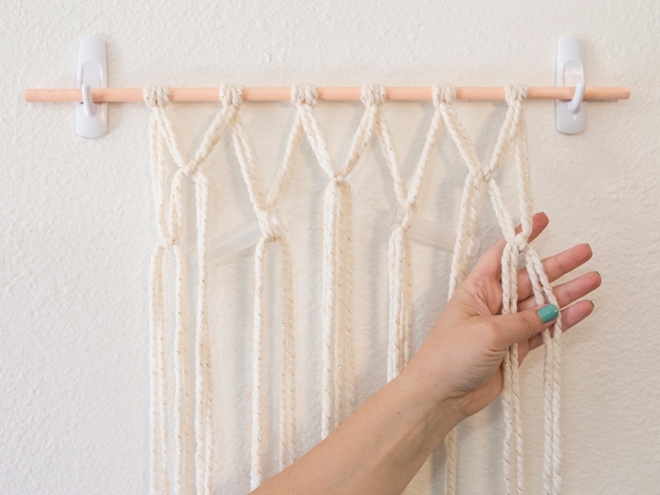 They may look complicated but they are literally just regular old double knots. 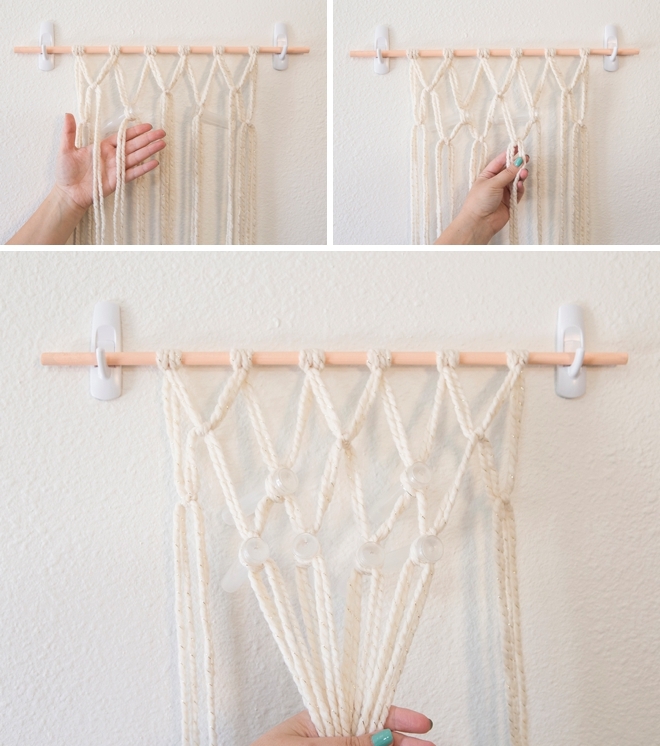 I kept this project super simple so that anyone could attempt and succeed! Mini-roses or other small flower! 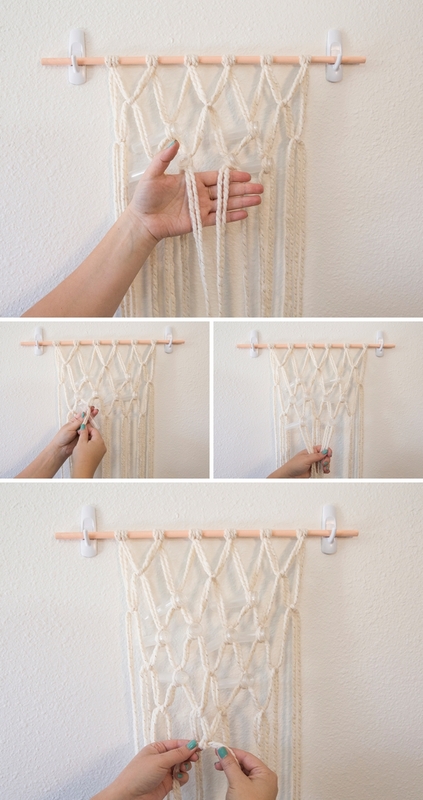 Cut 12 pieces of yarn around 72″ long, for each chair. Painting the dowels to match the flowers seemed like a good idea to me, and if it does to you too, then do it! We’re going to start off by creating 6 knots around the wooden dowel. 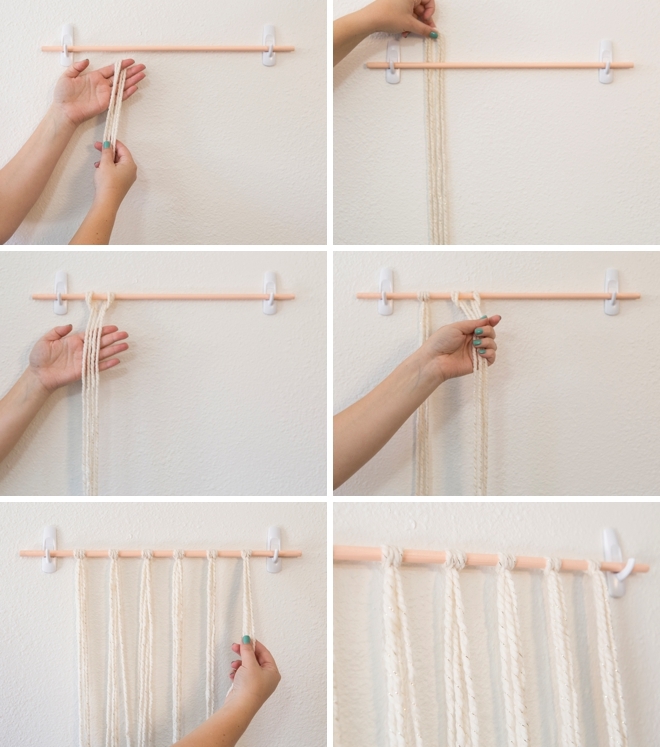 Hold two pieces of yarn, folded in half, behind the dowel and loop both ends inward – then pull tight. Pulling individual strands will help get the knot really tight. Evenly space them across the dowel. 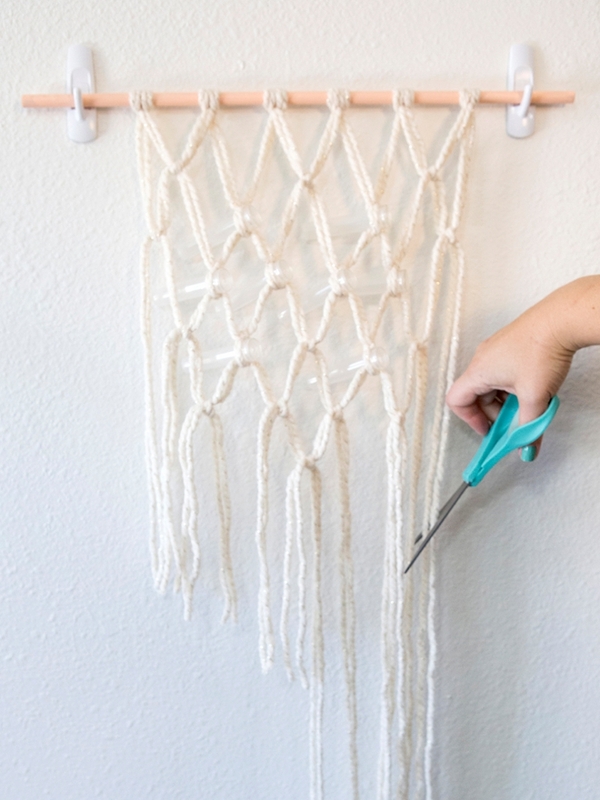 CRAFTER TIP: tape or hang your dowel to the wall, it will make knotting MUCH easier. Taking only two strands from both of the first two knots on the left, make a double knot about 1.5″ below the dowel. Do this three times. Now taking the two strands in between the three new knots you just added, double knot them about 3″ below the dowel. 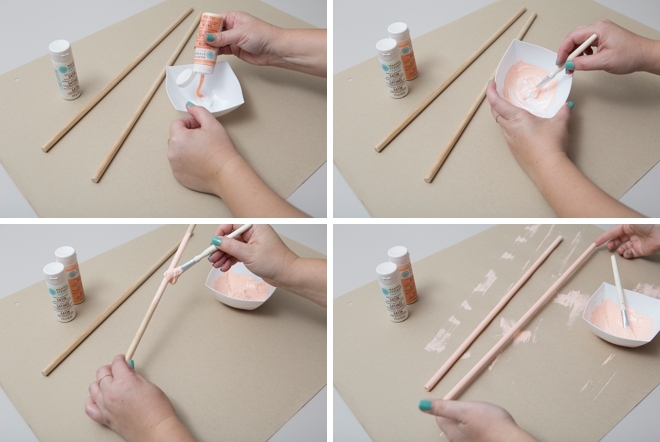 Adding the water tubes: Underneath those last two knots you added 3″ below the dowel, now knot a flower tube to each! 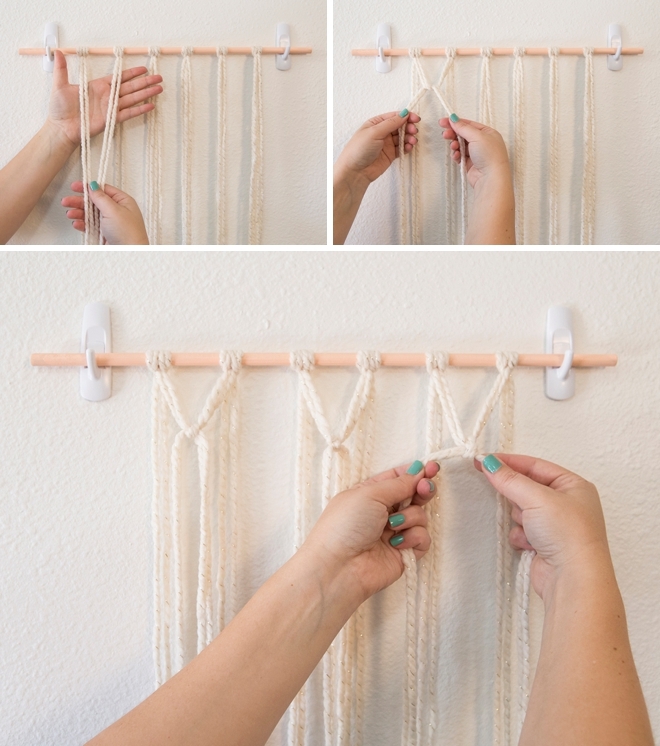 On both edges, add a knot with the two remaining strands at the same level as the water tubes. 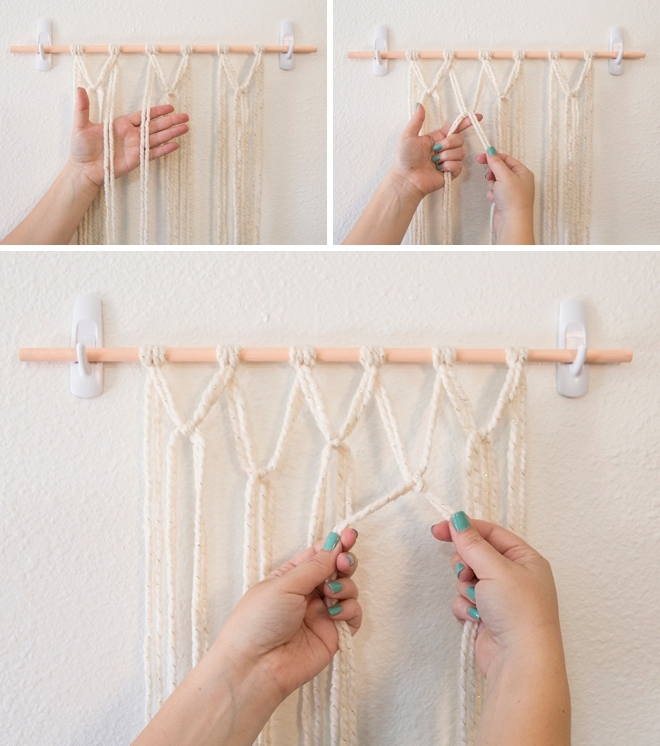 Next up, make a row of four knots all the same height across all strands, excluding the strands on the edges. Then add water tubes to all four knots. 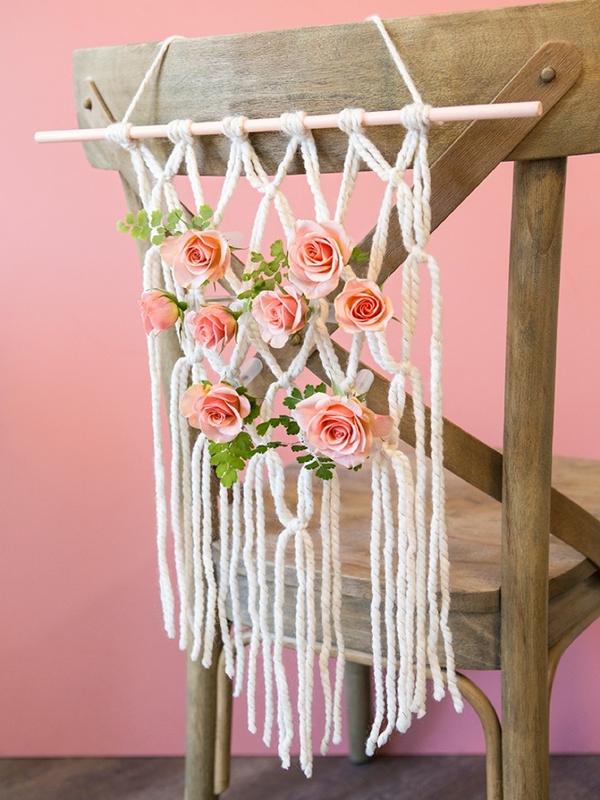 Working underneath the flower tubes, now create five knots and then add water tubes to the middle two knots. Next add a row of four knots below the flower tubes and then finish right under that in the middle, with one last knot! You’re done! 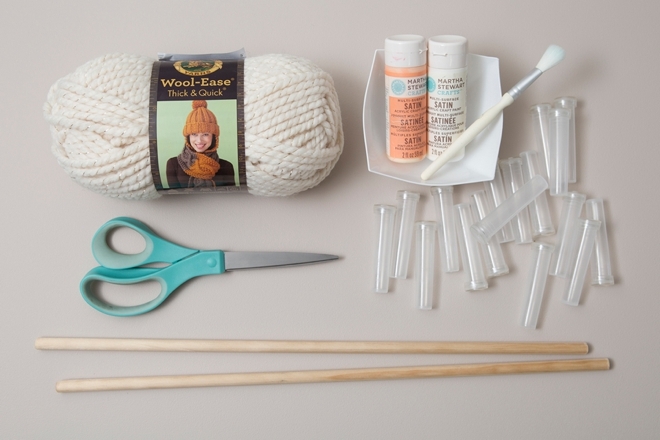 Since the tubes will already be tied onto the yarn hanging, your wedding planner can add water to each tube using the old straw + water trick. Remove the cap, add water and replace. 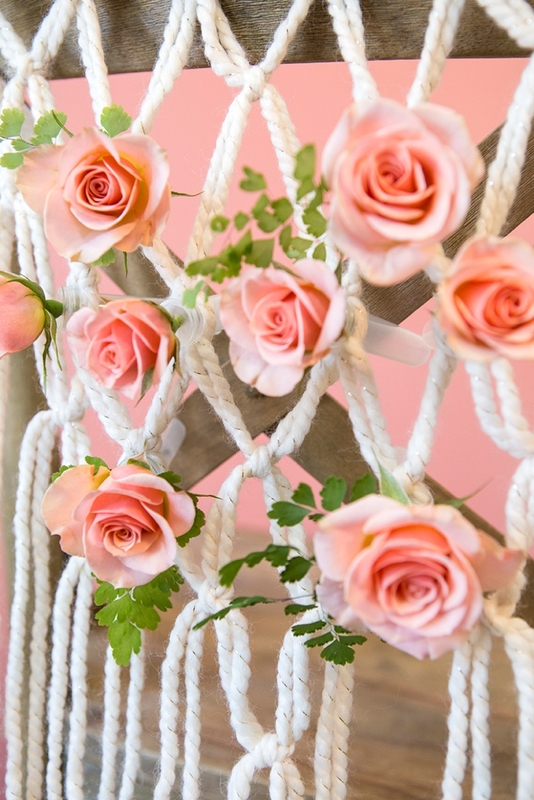 Add pretty, dainty flowers to each tube… maybe even with a few bits of fern! 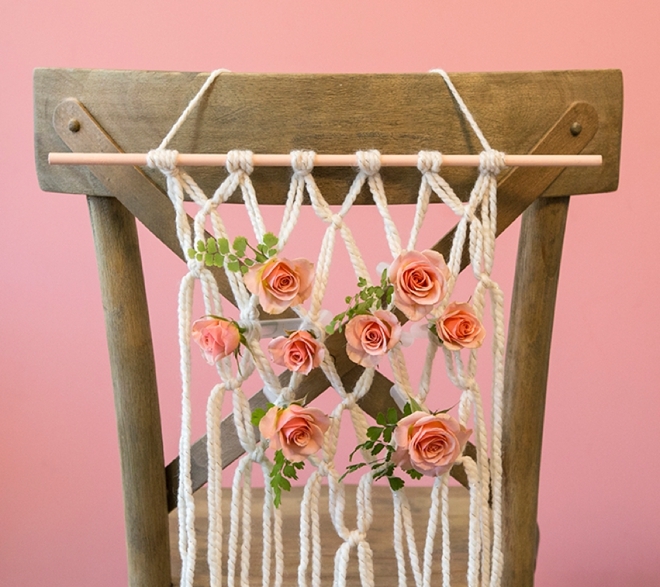 This project won’t work well with large flowers like Protea or Peonies… but these mini roses work great and so would anemonies, astilbe, lilac, or delphinium! Everyone’s chairs will be different. 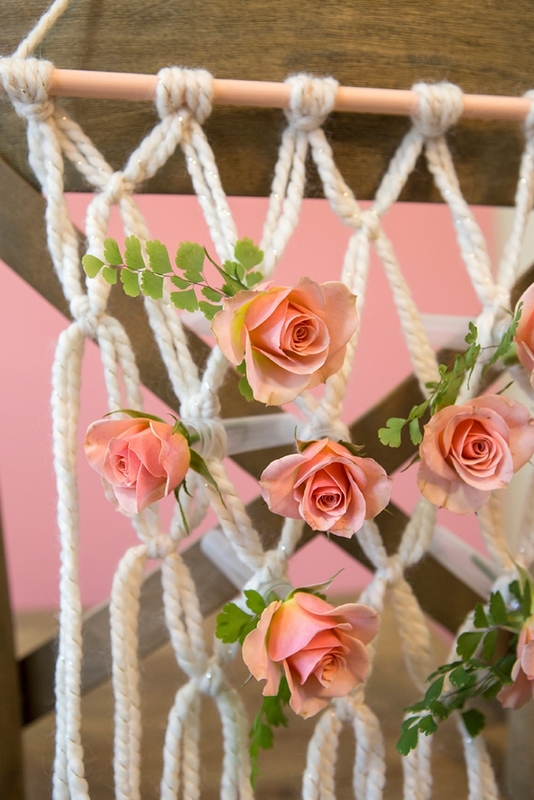 So you’ll have to come up with the best way to secure the hanging to the chairs at your reception location!